The left-wing Die Linke party along with the Ecologic Democratic Party (ODP) in Germany have joined to pursue a bid for the 2023 Summer Youth Olympic Games (YOG) for Munich. 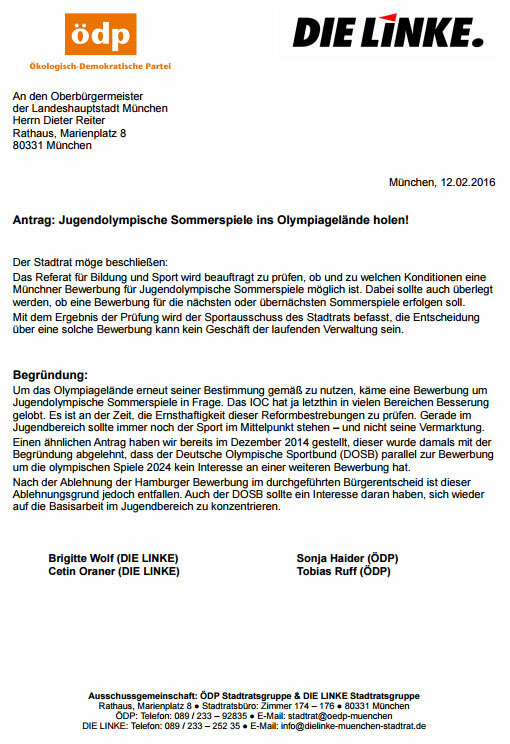 In a letter written to Munich Mayor Dieter Reiter last Friday, Die Linke’s Brigitte Wolf and ODP’s Sonja Haider urged City Council along with the Department of Education and Sport to investigate a possible bid for the quadrennial sport festival organized by the International Olympic Committee (IOC) for teenagers. The opposition parties filed a similar request in December 2014 but it was rejected because the German sport authority (DOSB) was already planning a bid for the 2024 Olympic Games and had narrowed the field to Hamburg and Berlin. Hamburg was given the nomination but was forced to drop from the race last November when it was narrowly defeated in a referendum. Munich lost its bid for the 2018 Olympic Winter Games, and a subsequent bid for the 2022 Games was rejected by voters in a 2013 referendum. Munich hosted the Summer Games in 1972 from which bid proponents believe they can leverage existing sport facilities and other legacies. Wolf and Haider believe that though voters rejected the high costs and risks of the Olympic Games, they’ll be interested in the YOG due to its focus on youth and sport and at a much more modest budget compared to a Winter Games. They say it will be the best way to use the existing Olympic Park for its intended purpose. The letter also comments on how the IOC has improved and initiated several reforms that can cut costs and risks. The next Youth Olympic Games for Summer sports is set to be held in Buenos Aires in 2018 after which the IOC will adjust the four-year cycle to odd years landing the next Games in 2023. This week the Winter YOG is being held in Lillehammer, Norway and the 2020 Games have been awarded to Lausanne, Switzerland. The Youth Olympic Games were first held in Singapore in 2010 and were last hosted by Nanjing, China in 2014. The 2023 YOG host city will be elected by the IOC in 2018.